Easily blend juice together and completely stops the juice from dripping when complete. Allows quick and easy rinsing between different recipes. Tritan is an environmentally safe BPA-Free material approved for use in food containers. This Eco-friendly material is used for the Juicing Drum of the Kuvings Whole Slow Juicer. With high pressure and slow rotation, it makes juice without destroying nutrients. 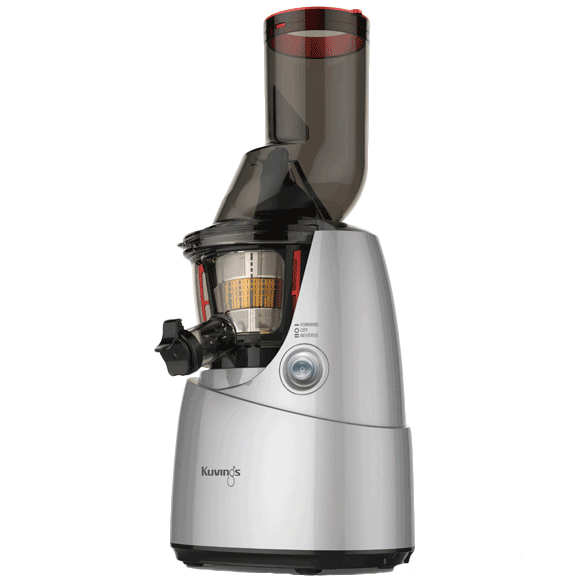 And due to the slow rotation, it can be used quietly unlike traditional juicers. 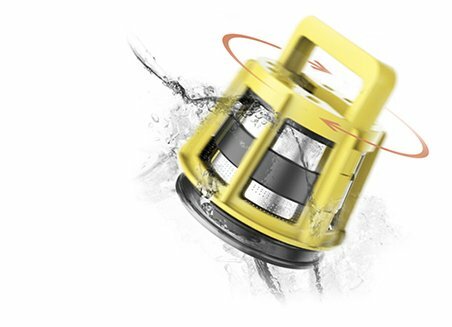 A dual safety system with a 3-way ventilation channel made with high quality and durable materials to provide the tastiest juice with most nutrition. Kuvings B6000 cold pressed juicer unique technology (J.M.C.S) produces a 100% natural undiluted juice by gently pressing the fruit with a slow-rotating screw in the strainer instead of grinding it with a fast-rotating blade. By inserting whole ingredients, this minimizes oxidation to the ingredients as they’re not pre-cut and exposed to the air before juicing. This preserves more nutrients, minerals, and enzymes, while providing high yield and the best possible taste. ULTEM is a safe, Eco-friendly material that is durable enough to be used for aircraft and medical equipment. ULTEM is used in the juicing screw and the strainer of Kuvings Whole Slow Juicer. This long and narrow section initially cuts the ingredients and guides towards the lower section. The wider section squeezes the ingredients against the strainer wall as it gets pushed downwards. 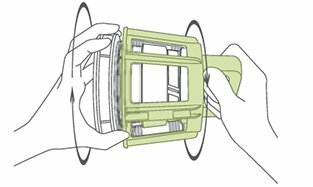 The space between strainer wall and the juicing screw gets thinner towards the bottom; this design, paired with a very power motor, guarantees the highest yield. 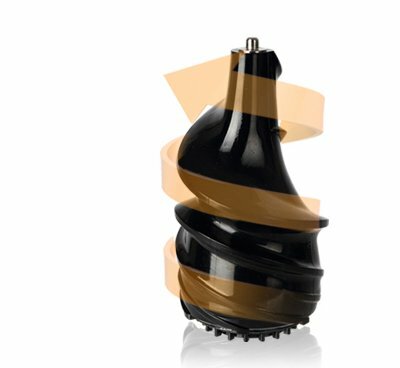 A patented rotating brush for optimal hygiene and easy cleaning. The world’s first wide mouth slow juicer, Kuvings’ patented, large 3″ feeding tube can easily accommodate whole produce items, reducing prep and processing time up to 40%. The unique Kuvings B6000 cold pressed juicer can make a glass of fresh juice in seconds without the drawbacks of high-speed and slow juicers like destroying important enzymes. Compared to other slow juicers, our juicer produces a richer juice, full of more nutrition. The juicer comes with the drip-free Smart Cap which is great for mixing juices and rinsing between recipes. 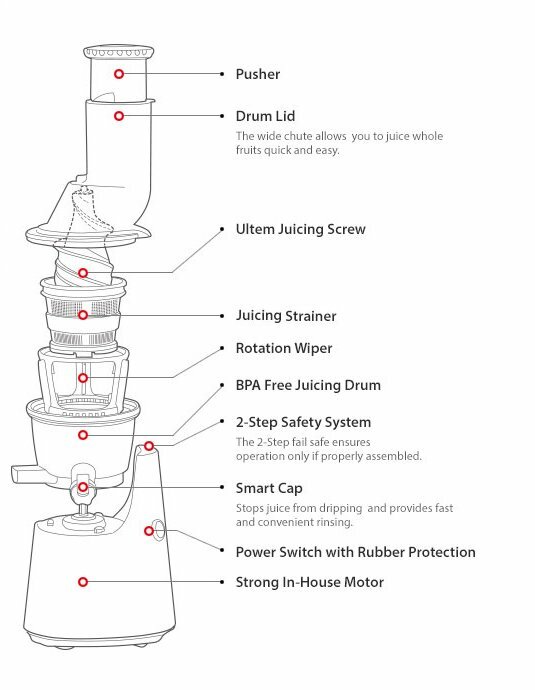 The BPA-free components keep juice away from unwanted chemicals found in other juicers and our patented easy cleaning tool makes cleanup a breeze. Store juice up to 72 hours.